It doesn’t matter if a cylinder is low, medium or high level. 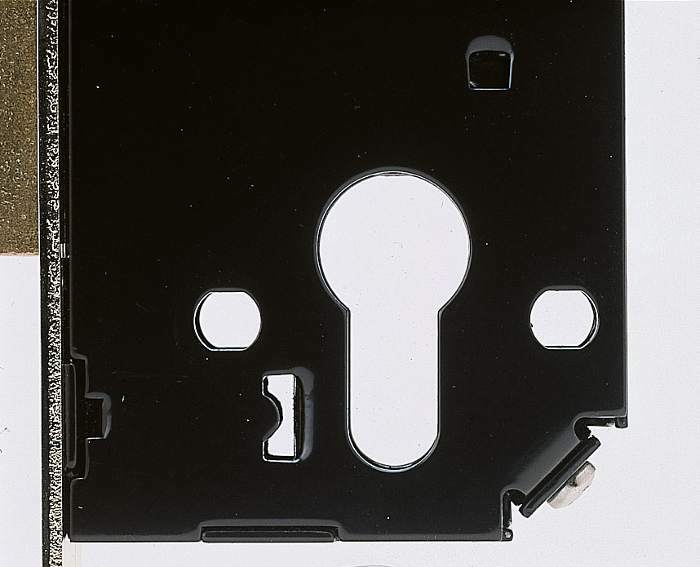 You can greatly increase its resistance by protecting it with a security escutcheon. The security escutcheon, also known as a “Defender” or security boss, is a true security shield that is mounted on the outside of a European profile cylinder, mainly to withstand attempts to break, remove or knock inside the cylinder itself. All European profile cylinders have a potentially weak point: the central part of the body. This is due to the obligatory presence of the hole for the fixing screw and the slot for the rotation of the cam (a sintered steel component, typically black, which transmits the rotary motion of the key to the lock mechanism to open or close it). The central part of the body of all European profile cylinders is weaker due to the hole for the retaining screw and the countersinking for the cam. For this reason one of the most common types of attack consists in attempting to break the cylinder at this very point, so that the outer half of the cylinder can be removed and the inner half knocked inside, thus providing free access to the lock, which can now be easily manipulated and opened. Different techniques can be used to break the cylinder. The easiest way can be performed if the cylinder protrudes outside, or if any decorative frame surrounding it can be broken in order to expose it. In this case it can be struck with a hammer, possibly using a chisel, or gripped with pliers and then broken. The security escutcheon protects against these types of attacks, but to be effective it must have a truncated cone or rounded shape, so that there is no way of gripping it with burglary tools. The security escutcheon must have a shape, such as that of a cone, which make it impossible to grip with burglary tools. Some older models had, on the other hand, a cylindrical shape which, paradoxically, could have simplified the work of thieves, as it could be easily gripped with a pipe to provide leverage for breaking the boss and cylinder together. But the advantages of a security escutcheon do not stop there. Good quality security escutcheons are also fitted with a drill-resistant plate. Another of the techniques which can be used to force a European cylinder is to drill the plug, or rotor. This can be used either to destroy the rotor or to make a hole which allows tools to be inserted for removing the plug. In each case the aim is to have free access to the cam which controls the movement of the lock so as to rotate it and open the lock. The most effective drill-resistant plates are the rotating ones, because when the drill bit touches them they begin to spin together with the drill bit, thus preventing it from advancing. The rotating plate oppose the action of drilling. The drill can also be used to attack a cylinder by drilling the body, in order to release the pins and counter-pins and leave the plug free to rotate. Even in this case, a sturdy security escutcheon is an excellent defence, by protecting the body with a thickness of high strength carbon steel and cemented in order to be efficient. Until now we have talked about methods of attack by brute force, against which the security escutcheon proves particularly effective. 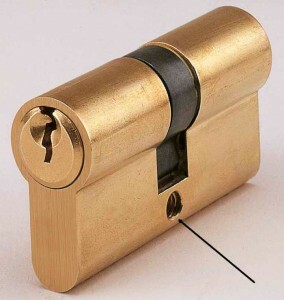 But a cylinder can also be opened by using lock picking and key bumping techniques. Although it is not designed primarily to protect against these types of attacks, a security escutcheon is still useful even in these cases, as by adding a screen in front of the cylinder it makes it harder to understand what is happening inside. As we have seen, a useful trick to make key bumping particularly difficult is to use a security escutcheon of a different make to that of the cylinder, thereby hiding any useful information for the potential thief in order to prepare or procure the suitable bump key. Of course, in order to be effective a security escutcheon must be attached in such a way that it cannot be easily pulled off. From this point of view, the most secure solution is to fix the escutcheon from the inside of the door. To do so, the case of the lock must have special DIN holes, one to the right and one to the left of the profiled slot for the cylinder. 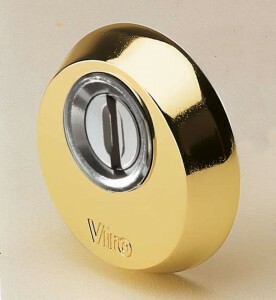 A lock by Viro with the 2 DIN standard holes on each side of the hole for passage of the cylinder. 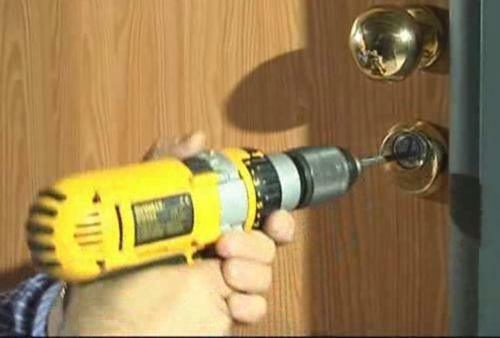 In this case, in order to carry out the installation on the door, simply drill the holes (if they are not there already) that match those on the lock for the through fastening screws; adjust the escutcheon to adapt it to the protrusion of the cylinder; cut to size the fastening screws and then lock the escutcheon and inner plate with the screws; lastly, cover the inner plate with the decorative plate. The quality of the fixing screws is also important. They must be made of hardened steel so that they do not break easily. In general, a security escutcheon is mounted if maximum protection is desired, so it is usually provided on top quality cylinders. Actually, though,, thanks to the low price, this solution is very well suited even to the lower quality cylinders. In effect, it corrects some of the weak points which particularly affect low quality cylinders, which do not possess, for example, in-built protection against pulling or drilling. Therefore, if one can, it is definitely advisable to install a security escutcheon with an excellent cylinder. But if your budget does not allow it, you may be wiser to focus on buying a good quality security escutcheon rather than a top end cylinder. This entry was posted in Locks and Cylinders and tagged products, tips on 9 October 2018 by Mara Rossi.